Map illustrating the activities of the 1st Western Australian Mounted Infantry in South Africa, 1902. Murray, P. L., Official Records of the Australian Military Contingents to the War in South Africa, pp. 396 - 398. In the Western Australian Government Gazette of 13th October, 1899, appeared a notification that His Excellency the Governor in Council had been pleased to sanction the formation of a Company of Infantry, with an establishment of 1 captain, 3 lieutenants, and 125 other ranks, for service with Her Majesty's Imperial Forces in South Africa. The period of engagement to be for one year, but this was subsequently extended (Western Australian Government Gazette, 19th October, 1900). Men between the ages of 20 and 30 were qualified for enlistment. There was a Machine Gun Section. For officers, upon the same scale as in other States; for Warrant Officers, N.C.O. 's, and men, as follows:- Company Sergeant-Major, 9s. per diem ; Sergeants 8s.. Corporals, 7s. ; paid Lance-Corporals' 5s. ; privates and buglers, 4s. 6d. ; 2s.6d. per diem to be retained as deferred pay and handed over on completion of engagement, but forfeited in case of desertion or dismissal for misconduct, and for every day on which actual pay was forfeited. It was stipulated also that pay and allowances were to be considered as in full; and that any payments made by the Imperial Government to members of the Contingent for service in South Africa, would be deducted there from. Uniform consisted of khaki drill jacket (2), drill trousers (3), F.S. hat, and forage-cap (Glengarry). Greatcoat, ankle-boots, and blue Guernsey were also provided, together with the following kit - 1 tin blacking, 1 pair braces, I set brushes, 1 button-holder, comb, knife, fork, and spoon, holdall, clasp-knife and lanyard, canvas kit-bag, razor and case, 3 flannel shirts, 3 pairs woollen socks, 1 piece soap, sponge, 2 towels. Arms and equipment. - M.L.E. rifle and bayonet, infantry valise equipment and entrenching tools. The Contingent went away on 7th November, 1899, consisting of 5 officers, 125 others, with 17 horses, 2 maxim guns, I spring-cart, and 2 wagons. Two officers, 4 others, died or were killed; 4 were struck off in South Africa; 5 officers, 115 others, returned to Australia. Two promotions from ranks. Captain H. G. Moor, promoted Major, 14th October, 1899. Lieutenant F. M. W. Parker, promoted Captain, let January, 1901. Lieutenant H. F. Darling, promoted Captain, 5th Contingent, 11th December, 1900. Lieutenant J. Campbell, Captain, 11th December, 1900; to 6th Contingent, 8th March, 1901. Major G. F. McWilliams (Medical Staff), promoted Lieut: Colonel, 12th December, 1900. Sergeant A. J. B. Brown, promoted Lieutenant, 22nd April, 1900. Captain, 5th Contingent, 25th June, 1901. Sergeant G. G. W. Hensman, Lieutenant, 1st January, 1900. Lance-Corporal A. E. Malay, became Lieutenant (6th Contingent), 8th March, 1901. Private F. W. Bell, commissioned Lieutenant, 6th Contingent, 8th March, 1901. For promotions of N.C.O. 's and men, vide nominal roll. The Contingent left Albany on the 7th November, 1899, in the transport Medic, together with Victorian, South Australian, and Tasmanian units, and arrived at Cape Town on 27th November. These companies were there formed into "The Australian Regiment," and were joined subsequently by a Company from New South Wales. 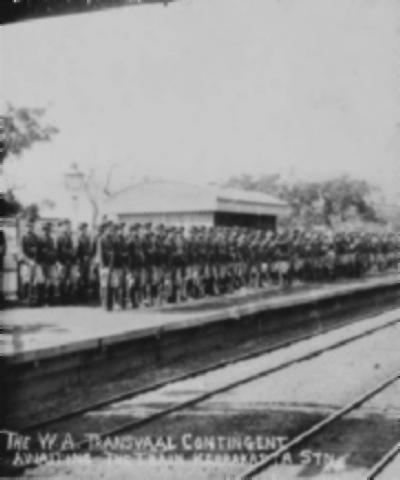 On lot December, the Regiment entrained for De Aar to join the Kimberley Relief Force; and were employed on the lines of communication between De Aar and Modder River. On let February, 1900, the Western Australian Company was converted into Mounted Infantry at Naauwpoort, as were also the others. For details of service between November, 1898, and April, 1800, when the Regiment was broken up, vide let Victorian Contingent, under “Australian Regiment." Reference may be directed to General Order, 10th February, 1804, quoted therein, with regard to the gallant defence of a kopje at Slingersfontein (afterwards known as “West Australian Hill") by Captain Moor, with Lieutenants Darling and Hensman, 2 sergeants, and 23 rank and file, against 300 or 400 of the enemy. Mention should be made of Private Krygger's gallantry. After Lieutenant Hensman had fallen mortally wounded, this soldier, under very heavy fire, endeavoured to build a sangar or wall round his officer, as a screen. 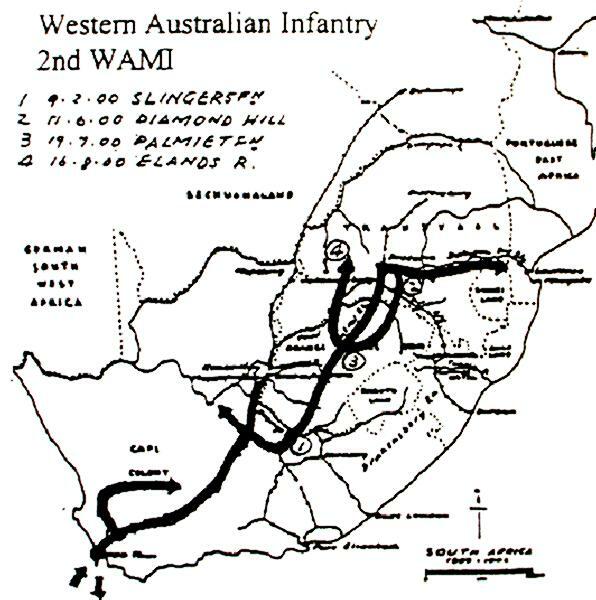 Subsequently the lot Western Australians participated in operations in the Transvaal, Orange Free State, and Cape Colony, including actions at Johannesburg, Pretoria, Diamond Hill, Wittebergen, Vet River, Zand River, Waterval Onder, and Colesberg, and many skirmishes. They were with General Clements' Column (as part of the Australian Regiment) ; with Major-General Hutton's Column on advance from Bloemfontein to occupation of Pretoria ; and with Colonel De Lisle's Column, from capture of Pretoria to departure from South Africa.
" At Diamond Rill, 12th June, 1900, the New South Wales Mounted Rifles were ordered to support the 6th Mounted Infantry battalion, and the lot Western Australian Mounted Infantry were held in reserve. About 2 p.m. the advance began, under cover of the pom-pom fire, which was directed on the Boar gun. As soon as De Lisle saw that the battalion had gained a footing on the hill, he brought the pom-poms under shelter of the wall of Rhenosterfontein Farm, at a range of 1,400 yards, and let go the New South Wales Mounted Rifles. Leaving their horses under cover of the dead ground, the Australians came on to the attack in column of troops, the men being opened out at intervals of 30 yards, with 50 yards distance between troops. Extended in this way, the 350 men of the corps created the appearance of a much larger force, and as they swarmed over the crest of the hill with fixed bayonets, the Boers, without waiting for the attack, retired to a second position, some 1,200 yards away. Darkness was just closing over Diamond Hill when the Boers beyond opened a furious fusillade all down the line ; the 2nd Coldstream (;}wards responded with equal energy. The sound as of a few do joie was beard over the whole field. But this was the end; far the English had captured the key of the Boer position." - Times History of the War. On the 27th June, a post on the railway near Roodeval station was attacked, but the enemy were repulsed by a detachment of the Shropshire Light Infantry with the 1st Western Australian Mounted Infantry, with the aid of a 15-pr. gun on an armoured train. Ridley's Mounted Infantry Brigade, including the let Western Australians, formed part of the force which Sir Archibald Hunter led into the north-east Orange River Colony, with a view of surrounding, if possible, the enemy under De Wet, and Prinsloo, in the Wittebergen, or Brandwater Basin, as the district was more generally called. On the night of the 15th July, De Wet, with about 1,600 men and some guns, escaped from Slabbert's Nek. General Broadwood, with the 2nd Cavalry Brigade and Ridley's Mounted Infantry, were sent in pursuit. The Boars succeeded in cutting the railway line. On 22nd July, General Knox, at Kroonstad, wired to the General in Command, Central Transvaal, the following from General Broadwood, sent by despatch-rider to Honingspruit, and telegraphed from there to Lord Kitchener:-"Have followed commando since 16th July. Had sharp fight at Palmietfontein on 19th July; prevented from pursuing by darkness. Eight dead Boers found. Our casualties-Billed, Major Moor, Western Australian Mounted Infantry, and four men ; wounded-Lieutenant Stanley, 10th Hussars, Lieutenant Tooth, Australian Contingent, and fourteen men." Major Moor's death was a heavy loss to the 1st Western Australians. His fine leadership had brought his corps into great prominence, considering their small number. There were, besides him, one killed, six wounded. In the fighting at Stinkhoutboom, 24th July, there were several casualties. At the relief of Colonel Hore at Eland's River, 16th August, the first troops to ride in and receive the thanks of the garrison were De Lisle's Western Australians, here scouting in front of Lord Kitchener's force, which comprised six regiments of regular cavalry. De Lisle's corps reached Pretoria on 28th August, and were thereafter employed in the Central Transvaal. At Waterval Onder, 3rd September, Lieutenant Darling and four men were wounded. On the 15th October, the 1st Western Australians were inspected by Lord Roberts in Pretoria, and were complimented on their work. On 13th December, 1900, the Contingent left Cape Town in the transport Orient, and arrived at Albany on the 29th. Disbanded on 29th March, 1901. Moor, Major H. G. (Captain, Royal Artillery). - Served in Rhodesian Campaign, 1897. Medal. Operations and actions in Transvaal and Orange Free State. Killed in action, 19th July, 1900. Parker, Captain F. M. W. - Operations in Transvaal, Orange Free State and Cape Colony, between December, 1899, and December, 1900. Actions at Johannesburg, Pretoria, Diamond Hill, Vet River, Zand River, and Colesberg, Despatches, London Gazette, 19th April, 1901, D.S.O. Queen's Medal with four clasps. Darling, Lieutenant H. F. - Operations and actions as stated, and in Natal. Slightly wounded, 3rd September, 1900. Subsequently promoted Captain and appointed to the command of the 5th Contingent, 11th December, 1900. Operations in Eastern Transvaal, including actions at Belfast and Rhenoster Kop. Despatches, London Gazette, 16th April, 1901, and 29th July, 1902. D.S.O. Queen's Medal with four clasps. Campbell, Lieutenant J. - Operations and actions as stated. Commanded Maxim Gun Section. Promoted Captain, and appointed to command of 6th Contingent, 8th March, 1901. Operations in Eastern Transvaal, Mentioned in Commander-in-Chief's despatches, 8th July, 1901. Queen's Medal with four clasps. The WAMI parading at Karrakatta Station awaiting their train. The following article and list of members of the 1st (WAMI) West Australian Mounted Infantry Continent is extracted from The West Australian, Monday 6 November 1899, page 5. That, in spite of the depressing influences of a cold, wet, blustery day, there should have been such an enormous crowd of people to witness the farewell appearance of the West Australian contingent from the city for Albany on Saturday, en route to South Africa, speaks volumes for the patriotic ardour which the decision to despatch a local body of troops to the Transvaal has evoked. There were many who were apprehensive that the threatening weather would deter most people from stirring out of doors, and a good deal of disappointment was felt at the prospect. These forebodings turned out to be groundless, as, notwithstanding the unpropitious appearance of the sky, the people of Perth, Fremantle, and Guildford, and the intermediate suburbs decided to brave the elements and be present to bid farewell to "our boys," as they were styled on all sides. To enable all those who wished to be present to gratify their desires, the Railway Department made special arrangements, and from two to half-past four in the afternoon, trains ran from Fremantle to Perth every quarter of an hour. As will be seen from the figures given later on, these were largely availed of, not only by the people of Fremantle but by those living in the intermediate suburbs, the result being that by the time the contingent arrived in Perth, the crowd in the city far outnumbered that, large as it was, which witnessed the local celebration of the Queen’s Diamond Jubilee. Similarly may comparison be challenged as regards the enthusiasm displayed on the two occasions. There can be no doubt that a more popular movement has never taken place in Perth. Whatever might be the feelings as to the necessity for the contingent, everywhere two feelings appeared uppermost, the one being a natural emotion of pride in the fact that Western Australia was taking part in the exhibition of loyalty which united Australia in manifesting towards the Sovereign and the Empire, and the other the universally ex- pressed conviction that, taking Saturday's demonstration in as merely one of a series witnessed throughout Australia, a more forcible demonstration of the solidarity of that. Empire and the loyalty of its peoples could not be afforded to the other nations on the globe. With a people thus moved it is only to be expected that the enthusiasm manifested upon such an occasion should be roused to its highest pitch. Everything else was forgotten. Politics were abandoned, business unheeded, and if anyone talked about anything besides the contingent, it was something akin to it - the progress of the Transvaal war. To do honour to the occasion most people were in holiday attire, and many of the places of business along the line of parade were decorated with bright bunting and gaily coloured streamers, whilst others were adorned with inscriptions of farewell and wishes for the safe return of the contingent. The streets thus decorated and filled with a crowd of humanity packed and wedged as closely as it was possible, exhibited a scene which will live in the recollection of all who witnessed it. From the time the contingent put in its appearance at the railway station, before which an enormous throng assembled, the enthusiasm knew scarcely any bounds. Along Barrack-street, from the station to the Town Hall, not only was the thoroughfare thronged to excess, but every balcony, window and parapet from which a point of vantage could be obtained was crowded. Cheer after cheer rang out as the men marched through the streets, and hats were waved and handkerchiefs fluttered with all that contagions exhilaration which such occasions inspire. After the troops entered the Town Hall to receive the fare- wells of the civic representatives on behalf of the city, the crowd dispersed to some extent, those who left doing so for the purpose of obtaining positions on the balconies and at the windows and, indeed, on the roofs of the buildings along the route to be paraded by the troops. When the civic function was ended and the parade took place, the sidewalks and roads were thronged, and all vehicular traffic having been suspended, a fine opportunity was afforded of seeing the contingent and the artillery and infantry, who marched with them, headed by the Headquarters Band. To the popular strains of “Soldiers of the Queen," played by the band, and in which thousands of voices joined, the men marched through the streets, followed by the huge concourse of people, who vied with those who watched the proceedings from various elevated positions, in shouting and cheering themselves hoarse. Wherever the troops went, they were followed by the crowds, till Mr. S. H. Parker's residence, "Karrakatta," was reached. There the contingent were entertained at tea by Mr. Parker, whose son, Mr. Frank Parker, is the popular first lieutenant of the contingent. Most of the people then dispersed, although some remained in the vicinity, notwithstanding the heavy rains which fell, and when the contingent again appeared in the street, and marched to the railway station, to take train to Albany, they were followed by as great a concourse of people as before, and their departure was accomplished amidst the wildest enthusiasm. For the rest of the evening the streets were filled with people far and above the large numbers which gather on a Saturday evening, and whatever sad hearts there were at home among those who had reluctantly and sorrowfully - if patriotically - parted with their dear ones, in the streets and hotels songs and cheers and laughter were heard, testifying to the enthusiasm which the occasion had evoked. But before Saturday's events are narrated in detail, it may be well to recall the history of the body of West Australian troops now on its way to the seat of war. The Formation Of The Contingent. It was early in the month of October that Western Australia decided to unite with the other colonies in contributing to the forces fighting on the British side in the Transvaal. At the time that the decision was arrived at, the Eastern colonies had already been busy getting their forces together, and as day after day went by, there seemed to be a strong feeling in many quarters that the colony ought not to stand out of such an undertaking. This feeling was especially strong amongst the volunteer forces. And though there were many who took an entirely opposite view, on the ground that the Empire, being in no danger, needed no help extraneous to its paid regular forces to fight against the Boers, there can be no doubt that the popular side-especially with young Australia - was that which asked that all Australia should join in sending troops to fight in a quarrel which, it was said, was as much Australia's as it was England's, in as much as both formed part of the Empire, and it was the Empire's troops which would do battle. Inspired with this feeling on the part of many, the national desire for adventure, the decision of the Government came early in October. Parliament, on the motion of the Premier, determined in favour of sending a contingent, and, upon the offer being cabled to the Secretary of State for the Colonies, it was promptly accepted. Then began the work of, formation. Even prior to this, headquarters had been almost deluged with offers of service, and these increased when once the decision of Mr. Chamberlain became known. Applications came in from members of volunteer corps and others all over the colony, and these continued till the selection was completed. The number of offers was far in excess of the number required. The Imperial Government consented to accept a unit of 125 men, commanded by a captain, with three subalterns, making a total strength of 129, and it is safe to say that had the number required been three times as large, it would have been forthcoming. With so much material to choose from, it became possible to make an excellent selection and, to impose somewhat exacting conditions as to age, height, and measurement, in order to obtain men of such physique and powers of endurance as would fit them 'to encounter the hardships of a soldier's life and campaigning in South Africa. They were required to be between the ages of 20 and 35, to be not less than 5ft. 7in. in height, with a chest measurement of 36in., and the medical examination was as severe as such tests can be in military service. Applications were received at headquarters and also by the commanding officers of country corps. Perth, Fremantle, and Guildford, York, Bunbury, and Geraldton sent applicants. Men on the goldfields unattached to any branch of the service, but some of whom had seen either regular or volunteer service elsewhere, offered. Notwithstanding the age limit, some below and others above it applied for enrolment, and were greatly disappointed by the necessary refusal following upon their offer. Civil servants and professional men, artisans, mechanics, miners, farmers, labourers, and others sent in their applications, many of them falling short of the required height and measurement, and whose appearance showed that their pluck was in inverse ratio to their apparent powers of physical endurance. About three weeks ago, enlistment commenced. The greater part of the men accepted were examined and enlisted at head quarters, Major McWilliams, one of the surgeons to the local defence forces, whose offer to accompany the unit to the Transvaal had been accepted, subjecting the applicants to a searching medical examination. When nearly a hundred men had thus been dealt with, they were ordered into camp at Karrakatta, where the remainder of the men, chiefly from the country districts, subsequently came for examination and enlistment. And it speaks well for the skill exhibited by Major McWilliams that of the 117 men whom he passed, only eight were subsequently discharged, and concerning the eight it may be said that most of them were discharged for indications of unfitness for service other than that of physical inability. By the time the men were ready to go into camp, it became known upon whom the choice of the Commandant, Colonel Chippendall, had fallen for recommendation to the Executive as officers of the contingent. Captain Moor, the officer in charge of the garrison at Albany, was appointed to command the unit. First Lieutenant Parker, of the Perth Artillery, a son of Mr. S. H. Parker, Q.C., was appointed senior lieutenant; Lieutenant H. F. Darling, of the Geraldton Rifles, a son of Mr. H. Darling, of Geraldton, was made second lieutenant; and the third subaltern was Second-Lieutenant J. Campbell, of the Perth Artillery, a son of Major Campbell, of the headquarters staff, Lieutenant Campbell being the transport officer. Sergeant Major J. A. Fraser, one of the warrant officers on the headquarters permanent staff, was appointed sergeant-major to the unit. Omitting the four commissioned officers, this gave 118 in the contingent, and the remaining seven required to make up the unit were taken from the garrison at Albany. The men are armed with rifles, and take with them two Maxim guns from Albany, which are in charge of-tho local men. At present, owing to the difficulty of obtaining sufficient khaki for uniforms, their uniform consists of a blue tunic, yellow Bedford cord breeches, blue puttees, and a grey felt hat, looped up at the side with a gilt kangaroo's head, but it is understood that when they reach the Cape they will wear khaki uniforms, should the latter be procurable. Their equipment includes sixteen horses and four waggons for baggage, arms, etc., and in every respect they are well provided for the life they will lead. Each man is enlisted for one year's service, and is liable to serve an extra twelve months. The work in camp has been anything but light. From first to last, the aim has been to train them exactly to the same kind of work as they will meet with in the Transvaal. This has subjected them to hardships for and away beyond those of ordinary military camp life, and their officers and the drill instructors speak in the highest terms of the zeal, energy, perseverance and intelligence which the men had brought to bear .upon their work. From “early morn till dewy eve" they have been exercised in various manoeuvres and military work, and practised in the use of the rifle, and the smartness with which they have performed the first and the skill they exhibited in the second, coupled with a high percentage "in firing practice, have been little short of marvellous, and while a large amount of credit for the results is due to the drill instructors, some also must be conceded not only to the men's quick responsiveness to instruction, but also to that enthusiasm and characteristic tenacity of purpose which have led them, night after night, when their day's work was done, to gather in small knots of four to half a dozen, each knot submitting itself to further drill by its best-instructed member. True it is that of the 117 only 26 have seen no previous service, but most of the remaining 89 have hitherto served in only volunteer regiments, and a great deal of their experiences during the past fortnight have been new to them. Upon the other hand, it may with some justice perhaps be claimed that the men are in some respects superior to those who are caught by the recruiting sergeant, and may be classed among the “pick" of the Australians. The results of the fortnight's camp were plainly evidenced in their appearance. Not only did they present a smart, soldierly appearance, but in the dark, tanned faces it was not always easy to recognise some of the much fairer complexioned men who volunteered for enlistment, and while it would be idle to pretend that the men of the West Australian Permanent Infantry yet approach the regularly trained regiment in drill, they have shewn themselves so thoroughly alert in their work that by the time the training they will receive on board the S.S. Medic, which bears them to South Africa, is completed they ought to take a prominent place amongst the rest of the united Australian contingent, to which their physique and abilities entitle them. Western Australia 16, South Australia 12, Victoria 49, New South Wales 6, New Zealand 2, England 20, Ireland 6, Scotland 3, Wales 1, Guernsey 2, Isle of Wight 1, Canada 1, East India 1, West Indies 1, Cape Town 1, and Germany 1. Leaving out the seven men from Albany, the commanding officer, and the drill instructor, all of whom are soldiers by profession, the professions or callings of the remaining 121 are as follows:- Labourers 22, agent 1, miners 5, carpenters 7, civil servants 7, prospectors 2, farmers 3, stockman 1, talleyman 1, tramway employee 1, smelter 1, assayer 1, chainman 1, student 1. physician 1. accountants 5, electricians 2, railway employees 2, mechanic 1, carter 1. , lather 1, drapers 2, baker 1, solicitor I, clerks 16, detective 1, packers 2, traveller 1, bootmakers 3, grocers 3, law clerk 1, hookbinder 1, butcher 1, stonemason 1, blacksmiths 2, engineers 4, painter 1, station-hands 2, secretary 1, driver 1, hairdresser 1, coachman . 1, yardman 1, sawyer 1, engineering cadet 1, printer 1, plasterers 2, plumber 1. Of the 130, 26, as already stated, have I seen no previous service. The service of the remaining 104 is as follows:- Western Australia 57, Western Australia and elsewhere 25, Eastern colonies 12, England 9, elsewhere 1. The following is a list of the contingent as they left Perth, including ages, birthplaces, and previous services. 1. Captain R. Moor, R.A., 28 (England). Served in Suffolk Artillery Militia, and in No 10 Mountain Battery, Natal, and other South African regiments. 2. Major McWilliams, Medical Officer (Victoria). Served in Prince of Wales Light Horse Infantry, Victoria, Melbourne University Infantry Company, and Perth Artillery. 3. Lieutenant F.W.M. Parker, 23 (Western Australia), solicitor. Served in Perth Mounted Rifles and No 1 Field Battery W.A. 4. Lieutenant H.F. Darling, 20 (South Australia), clerk. Served in Geraldton Rifles. 5. Lieutenant J. Campbell, 23 (Scotland), civil servant. Served in No 1 Field Battery, W.A. 1. Alexander Love, 20 years 10 months (Victoria), labourer. No previous service. 2. Charles Cobb, 34 years 10 months (England), agent. No previous service. 3. John Wilkinson, 35 years (England), miner. Served 7 years and 9 months in 2nd Battalion H.L.I. 4. Johnston Burley, 26 years (Ireland), carpenter. Served 3 years 2nd Regiment, Victorian Infantry, 2 years Perth Infantry. 5. Sidney Clare, 24 years (England), civil servant. Served 5 months 1st Surrey Volunteer Regiment. 6. Thomas Hutchesson, 20 years (Guernsey), prospector. No previous service. 7. Adam Mountjoy, 33 years 1 month (Western Australia), farmer. Served 16 years in 1st Infantry Regiment, Western Australia. 8. Frederick Bell, 24 years 4 months (Western Australia), civil servant. Served 3 years and 4 months in Perth Artillery. 9. Arthur Robinson, 23 years 4 months (London), labourer. Served 4 months in 1st Infantry Regiment, Western Australia. 10. Thomas Frederick Watson, 26 years (England), accountant. No previous service. 11. George Clarke, 24 years (South Australia), labourer. Served 18 months in Mounted Rifles, South Australia. 12. George Lowe, 26 years (South Australia), electrician. No previous service. 13. Harold Force, 20 years (South Australia), labourer. Served 5 months in 1st Infantry Regiment, Western Australia. 14. David Saunders, 26 years (South Australia), railway employee. Served 12 months in Perth Artillery. 15. Joseph Sedgwick Attwood, 24 years and 8 months (Fremantle), labourer. Served 2 years and 10 months in 1st Infantry Regiment, Western Australia. 16. John Cullen, 26 years 10 months (South Australia), civil servant. No previous service. 17. Harry Eckert, 27 years 5 months (New South Wales), labourer. Served 1 year and 3 months 1st Infantry Regiment, Western Australia. 18. George Neville Bishop, 24 years (New South Wales), accountant. Served 8 months in Fremantle Infantry. 19. George Jones, 21 years (Victoria), mechanic. Served 4 months in Perth Artillery Volunteers. 20. Frederick Williams, 24 years 7 months (Victoria), carter. Served 14 months in 1st Infantry Regiment, Western Australia. 21. Alfred J. Bessell Brown, 22 years (New Zealand), civil servant. Served 3 years and 3 months in Perth Artillery. 22. George Marshall, 27 years 5 months (New Zealand), labourer, no previous service. 23. Nathaniel Hart, 29 years (Victoria), lather. Served 7 years in 1st Victorian Infantry Regiment. 24. Charles Sidney Body, 25 years (England), civil servant. No previous service. 25. Alexander Morrison, 30 years (England), miner. Served 6 years Durban Artillery Militia. 26. John Allingham, 28 years (Victoria), draper. Served 5 years A Company Victorian Rangers. 27. George Clarke, 26 years (Victoria), baker. No previous service. 28. Frank Balding, 21 years (Victoria), carpenter. Served 15 months in Perth Infantry and 2 months in Perth Artillery. 29. Charles F. Campbell, 20 years (England), civil servant. Served 5 months Perth Artillery. 30. Murray William Collett, 21 years 2 months (Guernsey), clerk. Served 18 months with 1st Infantry Regiment, W.A. 31. George Augustus Moris, 24 years 9 months (Victoria), miner. Served one year with the Victorian Royal Horse Artillery. 32. John O’Connell, 32 years (Ireland), labourer. Served 8 years 110 days 1st Battalion R.I.F..3 months in Perth Artillery and Headquarters Band. 33. Barton Scobell Lessey, 29 years 11 months (England), detective. Served 9 months in Perth Artillery. 34. Arthur Spreadbury, 20 years 9 months (England), labourer. Served 12 months in 1st Infantry, W.A. and 6 months in 2nd Field Battery. 35. Leo Day, 23 years (England), clerk. No previous service. 36. Frederick Edwards, 24 years (England), clerk. Served 12 months 1st West Surrey Volunteers and 3 months in R.M.L. Infantry. 37. John Coward, 25 years (Victoria), packer. No previous service. 38. Philip Allen, 26 years 6 months (Victoria), labourer. Served 18 months in 1st Infantry Reg. W.A. 39. Robert S. Pye, 24 years (Victoria), traveller. Served 1 year 8 months Garrison Artillery, 12 months Victorian Infantry, and 18 months Perth Artillery. 40. Charles Scott, 21 years and 5 months (Victoria), bootmaker. Served 19 months in Perth Artillery. 41. Percy Edwards, 24 years 10 months (Victoria), clerk. Served 3 years 9 months Victorian Field Artillery, and 8 months Perth Field Artillery. 42. Charles Leigh, 22 years (Victoria), bootmaker. Served 4 years 10 months in F. Company Victorian Rangers. 43. Evan Davies, 27 years 11 months (Victoria), carpenter. Served 4 months 1st Infantry Reg., W.A. 44. Albert Charles Bowden, 21 years 6 months (Victoria), grocer. Served 18 months 1st Infantry Reg., W.A. 45. John Charles Yeo, 21 years (Victoria), law clerk. Served 1 year 9 months Perth Artillery. 46. William Alexander Murray, 24 years (Vic. ), clerk. No previous service. 47. Malcolm McSwain, 22 years 8 months (Victoria), labourer. Served 5 months Guildford Infantry. 48. Stephen Kenny, 22 years (Victoria), bookbinder. Served 4 years 2nd Victorian Regiment Infantry and 18 months Perth Infantry. 49. Richard Austin, 25 years (Victoria), accountant. Served 15 months Perth Artillery. 50. Alexander Bidwell, 27 years (Victoria), butcher. Served 12 months with Naval Brigade, Victoria. 51. Levi France, 21 years (Victoria), stonemason. Served 12 months in Perth Infantry and 2 months Perth Artillery. 52. Robert Corkill, 21 years (Victoria), blacksmith. Served 2 years 1st Infantry Regiment, Western Australia. 53. Herbert Loughton, 22 years 4 months (Victoria), engineer. Served 4 months in 1st Infantry Regiment, Western Australia. 54. Charles Dickman, 22 years 7 months (Victoria), labourer. Served 5 months in 1st Infantry Regiment, Western Australia. 55. George Wheeler, 21 years 3 months (Victoria), painter. Served 9 months in Field Artillery, Victoria; 5 months 1st Infantry Regiment, Western Australia. 56. John George Warren Vernon, 26 years 2 months (England), electrician. Served 5 years and 39 days Victorian Permanent Artillery, 1 year Harbour Trust Battery, G.A.V., and 9 months Perth Artillery. 57. Martin Bulmer Kay, 22 years 6 months (England), engineer. Served 2 years 1st Lanark Volunteers. 58. Arthur Vivian Gellatly, 22 years 4 months (Victoria), farmer. No previous service. 59. Arthur Green, 21 years 7 months (England), station hand. Served two years with Geraldton Rifle Volunteers. 60. John Edwin Tratham, 22 years 4 months (South Australia), secretary. Served 2 years in South Australian Infantry and 1 year in South Australian Garrison Artillery. 61. Albert Edwin Kelly, 21 years 8 months (Victoria), labourer. No previous service. 62. Norman Sherard, 21 years 9 months (Victoria), clerk. No previous service. 63. Michael Patrick Smith, 28 years 6 months (New South Wales), labourer. Served 1 year 6 months in 3rd Infantry regiment, New South Wales. 64. Thomas Sidney Golden, 21 years (Victoria), grocer. Served 7 months in Fremantle Artillery. 65. Arthur Herbert Baker, 25 years (Victoria), labourer. No previous service. 66. Walter Brown, 27 years 2 months (South Australia), driver. Served 3 months in Fremantle Artillery. 67. William Davies, 33 years (Wales), miner. Served 7 years and 86 days in 21st Hussars. 68. Edward Joseph Cunningham, 20 years (South Australia), coachman. No previous service. 69. James Arthur Smith, 26 years (Victoria), railway employee. No previous service. 70. Thomas Shannon, 23 years (Victoria), station hand. No previous service. 71. Carl Alfred Forsberg, 22 years, yardman. No previous service. 72. John Samuel Feare, 31 years (New South Wales), sawyer. Served 7 months in New South Wales Naval Volunteer Artillery. 73. Alfred Thompson, 20 years (West Australia), engineering cadet. No previous service. 74. James Cunningham, 22 years (South Australia), printer. Served 15 months in Perth Artillery. 75. John Barry, 27 years (South Australia), plasterer. Served 14 months Perth Artillery. 76. Graham Dunn, 34 years (Victoria), labourer. No previous service. 77. John Dunn, 28 years (Victoria), labourer. Served 1 year Victorian Mounted Rifles; 1 year Guildford Infantry, West Australian. 78. George S. Bailey, 26 years 9 months. Stockman. Served one year in W.A. Police Force. 79. George Loane, 24 years 6 months (West Australia), packer. Served 3 years 1st Infantry Regiment, West Australia;1 year 11 months Permanent Artillery, West Australia; and 3 years No.2 Field Artillery. 80. Thomas Hamilton, 25 years 5 months (West Australia), talleyman. Served 6 years 1st Infantry Regiment, West Australia. 81. Thomas Ashmere, 23 years (Western Australia), labourer. Served 2 years in Perth Infantry. 82. Joseph Henry Minchin, 20 years 1 month (West Australia, farm labourer. Served 10 months in 1st Infantry Regiment, Western Australia. 83. William Checkly Mills, 20 years 11 months (New South Wales), clerk. Served 2 years and 6 months in Perth Artillery. 84. Phillip John Jones, 21 years 5 months (Western Australia), carpenter. Served 18 months in 1st Infantry Regiment, Western Australia. 85. James Richardson, 28 years (England), plasterer. No previous service. 86. William Richard White, 23 years (Western Australia), bootmaker. Served 5 years in Perth Infantry. 87. Edward Robson Campbell, 24 years 7 months (Victoria), carpenter. Served 2 years and 6 months in Perth Artillery. 88. William Callicott, 33 years (England), labourer. Served 12 years Devonshire Regiment and 18 months in the 1st Infantry Regiment, Western Australia. 89. Alexander Sweeney, 21 years three months (West Australia), draper. Served six years in 1st Infantry Regiment, Western Australia. 90. Charles Mitchell, 26 years 11 months (London), plumber. Served six years 1st Infantry Regiment. 91. Arthur Wentworth Groser, 22 years three months (Canada), clerk. Served 10 months in Perth Infantry. 92. Graves Gifford, 35 years (Bungalore, East India), engineer. Served two years as lieutenant Surrey Militia and three years as lieutenant 13th L.I. Resigned, 1884. 93. George Johnston, 25 years six months (Victoria), clerk. Served two years D Company Rangers (Victoria), and 11 months in Perth Artillery. 94. Alexander Kruger, 31 years 6 months (Victoria), engineer. Served eleven years with the Victorian Militia. 95. Alexander Wark, 32 years (Scotland), clerk. Served two years Mounted Rifles, New South Wales. 96. Michael Conway, 28 years four months (Victoria), tramway employee. Served with C Battery, Victorian Field Artillery, and with No.1 Field Battery, Perth. 97. James Ansell, 34 years 7 months (Isle of Wight), smelter. Served two years 1st Brigade 2nd Battery Senior Division, R.A. (purchased discharge). 98. Robert Wauchupe, 22 years (Ireland), farmer. Served two years with Fremantle Artillery. 99. Jacques Forquharson Messer, 25 years 8 months (Victoria), clerk. Served two years with Victorian Cadets. 100. Geoffrey Hensman, 24 years (Bermuda, West Indies), miner. Served from October 1895, to March 1897, in Royal Horse Guards (purchased discharge). 101. David McComb, 27 years 9 months (Ireland), accountant. No previous service. 102. Lionel Monger, 22 years 5 months (West. Australia). Served six years with York Infantry. 103. John Reynolds, 26 years 6 months (South Australia), assayer. No previous service. 104. John Bird, 32 years 7 months (New South Wales), labourer. Served six months with Bunbury Rifle Volunteers. 105. John Edgar Kidd, 21 years 4 months (Victoria), clerk. Served 2 ½ years Geraldton Rifles. 106. Albert Maley, 25 years (Western Australia), blacksmith, served one year Geraldton Volunteers. 107. John North, 28 years 1 month (Belfast, Ireland), carpenter, served three years Bunbury Rifle Volunteers. 108. Septimus Lachlan Shaw, 20 years 7 months (Victoria), labourer, served 18 months Bunbury Rifle Volunteers. 109. Charles Ferguson, 22 years 8 months (Capetown), clerk served two years Geraldton Rifle Volunteers and three years cadets, Victoria. 110. Walter Richard Birch, 21 years 10 months (Victoria), chainman, served two years cadets, Victoria, and 15 months Bunbury Rifle Volunteers. 111. Frederick Simon Cecil Brown, 26 years 9 months (Kent), clerk, served 12 months Plantagenent Rifles, six months Fremantle No.2 Battery, and Albany Volunteer Artillery. 112. Samuel John Uncles, 30 years 6 months (Ireland), student, served 12 years 47th Regiment. 113. Godfrey Moore, 32 years 10 months (Western Australia), prospector, no previous service. 114. John Maxwell Ferguson, 24 years 3 months (Western Australia), clerk, served with Cadets Corps Geelong Grammar School. 115. Alexander Douglas, 26 years 11 months (Victoria), hairdresser, served one week York Volunteers. 116. Thomas McFarlane, 21 years 10 months (Victoria), grocer, served five months Perth Artillery. 117. Hugh Thomas Shaw, 25 years 4 months (Victoria), carpenter, served two years Bunbury Rifles. In Charge of the Maxim Guns. Bombardiers Copeland and McWhirter and Gunners Geale, Paul, Reynolds and Treblecock. Served in Western Australia and elsewhere. Murray, P. L., Official Records of the Australian Military Contingents to the War in South Africa, pp. 399 - 402. The Roll of Honour contains the names of all the men known to have served at one time with the 1st West Australian Mounted Infantry and gave their lives in service of Australia, whether as part of the 1st West Australian Mounted Infantry or another unit during the Boer War.